Regency Adapted Kitchens are a nationwide specialist manufacturer and installer of inclusive adapted kitchen furniture incorporating adapted appliances, storage solutions and our state of the art electronic rise and fall worktops and wall unit systems. Our unique rise and fall system and innovative design offers a solution allowing a single space to be adapted for the use of everyone, as we have proved with our recent projects in schools and colleges nationwide. Our aim as a company is to firstly make sure our design works for the individual needs of every customer. We have found through our research of the industry that many kitchen adaptations are carried out with minimal positive effect on the end user. Using our experience and knowledge our design experts consider all of the problems encountered by the user and systematically overcome them using specialised equipment such as; side opening ovens, induction hobs, dishwasher drawers, refrigeration drawers, long lever taps and of course our electronic rise and fall units both at worktop and wall unit level. We offer an unrivalled no obligation consultancy service which consists of a site visit, exact costing of the equipment including installation, a 3D plan and design of new kitchen and guidance and support in exploring all funding options available to you. 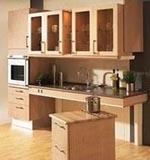 In summary at Regency Adapted Kitchen Solutions we will manufacture a kitchen specifically to suit your personal needs, making the task of using your kitchen a much more practical and ultimately pleasurable experience.